Why does ANU not support IE 7? Internet Explorer (IE) 7 was released by Microsoft in 2006. In 2006, the world was watching Cars in the cinema, and Malcolm in the Middle on TV. There were no iPhones, iPads, Android phones or tablets. The world was a different place - and so was the internet. Since 2006, the internet has changed quite a bit. Not only are there more pictures of cats than ever, there are also new technologies being used to create websites. Poor old IE 7 was never designed to understand new technologies like HTML 5. However, if we want to give a modern web experience to you, we need to use some of these newer technologies. IE 7 users now constitute less than five per cent of the visitors to ANU websites. We can no longer justify the effort needed to make sure everything still works in such an old, superseded browser. Hence we are not going to make any special concessions to IE 7, and we will not be testing our sites in IE 7. If you work in an organisation, you will most likely have a friendly IT support person who can look at updating your browser to something created this decade. If you're on a personal machine, you should be able to update your version if IE - visit the IE download page. You could also try another browser such as Chrome or Firefox on Windows. If you're not sure what to do, no doubt you have a family member, neighbour or friend who 'knows stuff about computers'. Buy them some chocolate and they will gladly help you get a recent browser installed. 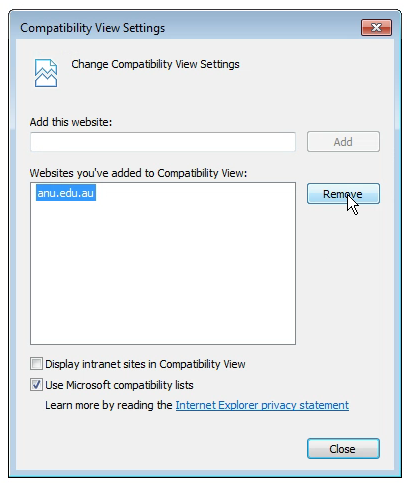 Compatibility View is a way for your modern Internet Explorer to pretend to be IE 7. Put simply, it throws away all of the progress since 2006, and you end up getting a bad experience on modern websites. Compatibility View was originally designed to be used on old websites that were created in the early 2000s. It's not intended to be used on modern websites. How do I turn off Compatibility View? There are a couple of different methods for turning off Compatibility View depending on which version of IE you are using. And if you find you can't change your browser settings, don't panic. In IE 8, 9 and 10 there should be a an icon next to the address bar which looks like a piece of paper broken in two. Select the icon to turn off Compatibility View. Compatibility View shortcut icon (highlighted) and location for IE 9 and 10. Compatibility View shortcut icon for IE 8. In IE 11, select the cog ('Tools' menu) in the top right, then select 'Compatibility View settings'. This will show a list of websites that have Compatibility View enabled. Remove 'anu.edu.au' from the list. You may also need to untick 'Display intranet sites in Compatibility View. Select Close once removed. 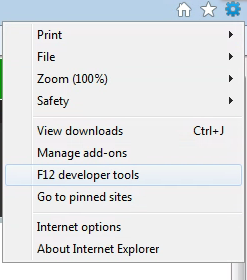 if you are familiar with Development tools, in IE 8, 9 and 10 you can also select the cog ('Tools' menu) in the top right or 'Tools' in the browser menu bar, then select 'F12 Development tools'. Alternatively press F12. This will bring up the development console. In the menu at the top of the Development console, select 'Browser mode' then select the most recent version of your browser. Close the console or press F12 again. 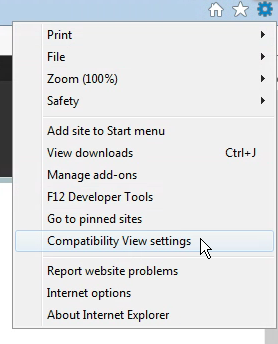 Turning off Compatibility View through Development Tools in IE 9. Turning off Compatibility View through Development Tools in IE 10. What if I can't change my browser? Don't panic. If you really need to continue using IE 7, and you can't change to IE 11, or another browser such as Chrome or Firefox, then that's OK by us. ANU websites should still mostly work in IE 7. You may find that pages don't layout properly in some cases, or that some features don't work. As time goes on, the problems may increase. We won't stop you from using IE 7, but we won't make any effort to fix problems that are particular to IE 7.